• Diazepam, diazoxide, or lidocaine because the risk of their side effects may be increased by Evista. • Evista comes with an extra patient information sheet called a Medication Guide. Read it carefully. Read it again each time you get Evista refilled. • Take Evista by mouth with or without food. • Take Evista on a regular schedule to get the most benefit from it. Taking Evista at the same time each day will help you remember to take it. • Continue to take Evista even if you feel well. Do not miss any doses. • If you miss a dose of Evista , use it as soon as possible. If it is almost time for your next dose, skip the missed dose and go back to your regular dosing schedule. Do not use 2 doses at once. • Follow the diet and exercise program given to you by your health care provider. Talk with your doctor about whether you should take a calcium and vitamin D supplement while you use Evista . • Talk with your doctor about the use of weight-bearing exercises to help prevent weak bones. • Evista should be stopped at least 72 hours before surgery or any time you will be confined to a bed or chair for a long period of time (eg, long car ride, long plane flight, bedrest, illness). Tell your doctor or dentist that you take Evista before you receive any medical or dental care, emergency care, or surgery. Tell your doctor if you will be traveling, or any other time you may be confined to a bed or chair. • If you are traveling (eg, long car ride or plane ride), try to avoid sitting in one place for a long time. Be sure to get up and move around as often as possible to help avoid the risk of blood clots. • Evista is not recommended for use in men. • Lab tests and medical exams, including bone density, breast exams, and mammograms, may be performed while you use Evista . They may be used to monitor your condition or check for side effects. Be sure to keep all doctor and lab appointments. • Evista should not be used in CHILDREN; safety and effectiveness in children have not been confirmed. 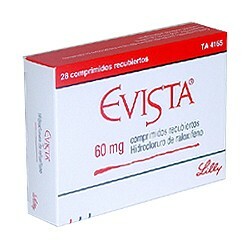 • PREGNANCY and BREAST-FEEDING: Do not use Evista if you are pregnant. It may cause harm to the fetus. Avoid becoming pregnant while you are taking it. If you think you may be pregnant, contact your doctor right away. It is not known if Evista is found in breast milk. Do not breast-feed while taking Evista . • Hot flashes; increased sweating; joint aches; leg cramps. • Severe allergic reactions (rash; hives; itching; difficulty breathing; tightness in the chest; swelling of the mouth, face, lips, or tongue); abnormal vaginal bleeding; back or side pain; blurred vision, loss of vision, or other vision changes; breast pain, tenderness, swelling, lump or discharge; chest pain; coughing up blood; confusion; flu-like symptoms; leg or calf pain, warmth, or swelling; one-sided weakness; shortness of breath; slurred speech; swelling of the hands, arms, legs or feet; unexplained bleeding.